Rank: Conspiratorial Rank 0 to 3. In Charge: Barbarians – specifically Savage Warriors (DF Denizens – Barbarians, p. 7-8) and Survivors (Barbarians, p. 8-9) –, Knights, and Scouts. In the Ranks: As above, plus archers, brutes, guards, knights, native guides, skirmishers, and squires. On the Payroll: Anyone else. Influencing the AR: Carousing or Leadership. The Wardens are a local brotherhood of warriors who patrol the local wilderness and try to keep the beast-men and faeries away from civilized lands. They are not officially sanctioned or backed by the governor or city council, but they receive substantial backing from some of the older, wealthier families in Alnwich. The origins of the Wardens is lost in the fog of antiquity, but all signs suggest it existed before the Starfall in some form. 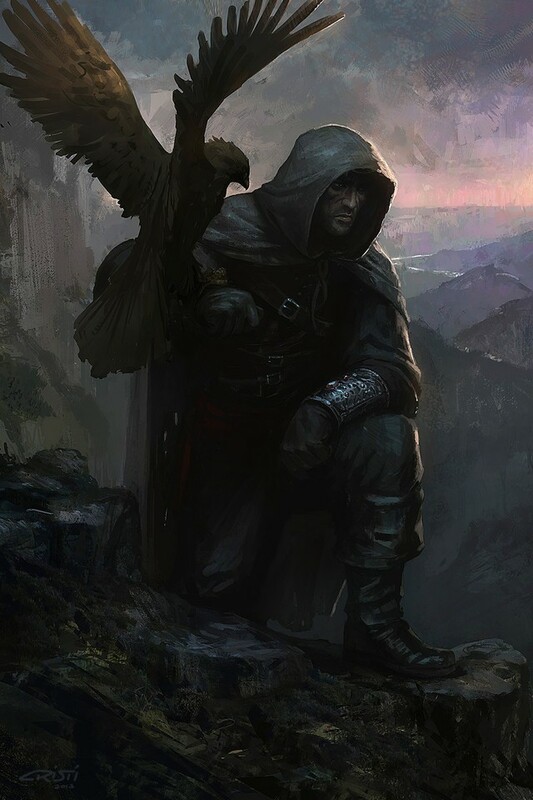 More recent records mention the Wardens performing a variety of wilderness-related services for Alnwich and the surrounding villages, including patrolling the forests for faerie or beast-man incursions, taking the offensive to claim territory for Northwatch, and exploring the wilderlands. The Wardens are run by a council of veteran wilderness warriors, but major decisions are made by brotherhood-wide vote. While they may fall into a loose military chain of command in combat situations, within the organization, everyone is ostensibly equal. Still, more senior members tend to hold greater influence than acolytes. The proper form of address between members is Brother or Sister, regardless of Rank. The Wardens are always looking for a few good men to join their ranks and watch over the wilderness, and they maintain standing bounties on a variety of monsters that plague the surrounding wilderness. They generally do not concern themselves with bandits or highwaymen, however, leaving the garrison in Alnwich to deal with ruffians and thieves. The Wardens will also pay handsomely for maps and information on the Dunweald, the Skaldafoll, and their inhabitants. On occasion, they will approach warriors with offers of payment for specific missions. These are usually offensives against beasts and monsters and may involve supporting Warden elements or solo missions into the wilderlands. Professional goods include weapons, light and medium armor, and wilderness survival equipment suitable to the region, and they can provide training in any traits or skills from the barbarian or scout templates. Backup. When the Wardens turn out, they show up in force. +3 to ARs, and add Rank x 2 to the number of people who show up. Favor. The Wardens are good for their word. +3 to effective frequency of appearance. Lore. The Wardens have information on what lurks deep within the bowls of Siedrborg and can answer questions about its history and inmates. They can also answer questions about the surrounding wilderness with Area Knowledge-15. Map. One thing the Wardens have is knowledge of the wilderness, and that includes maps! Mounts & Vehicles. The Wardens keep horses, dogs, and sleds for travel. These can be made available on a successful AR. Provisions. As long as tasteless travel rations and hard tack that can chip teeth is your thing, the Wardens can provide rations aplenty. Special Orders. The clan gives double the usual discounts, to a maximum of 80% off on survival gear, and AR is at +3. Other ARs are at -4 or worse.